The Hindus in Kabul and Kandahar suffer from not having a proper area for cremation and are forced to move the bodies to other provinces and even across the border at some instances. According to their religious rituals, the bodies of children above two years of age are to be burnt whereas younger than that is to be buried. For centuries, the Hindu and Sikh communities have been living in the capital as well as the other provinces of Afghanistan and possess Afghan nationality. Diyan Anjan, Head of Hindus and Sikhs council said that they are facing this problem since four years. For 120 years they performed cremation in the Qalacha area of Kabul but now the residents of that area do not allow it and they have to move the bodies to Ghazni, Khost and Nangarhar provinces and even to Peshawar city in Pakistan. He further added that this issue was addressed to the government, the Municipality of Kabul, police, Ministry of Hajj and Pilgrimage and the Parliament but till now, no proper area has been given to them. Uttar Singh, selected senator of Hindus and Sikhs in Lower House said that in 2005, they took two bodies from Kabul to Khost province, two other bodies to Jalalabad city in 2006 and another two bodies in 2007 to Ghazni province for cremation. He elaborated that two weeks back they took a body to Qilacha area for cremation but the people didn’t allow them and they were forced to take it to one of the deserts in the Char Asyab district of Kabul. He added that this problem was also faced by the Hindus and Sikhs of Kandahar who are even insulted by people. According to him, a delegation met Hamid Karzai in 2003 and he ordered the Kabul Municipality to give a land to them for cremation but it is pending till today. They were given a land in the Pul-e-Charkhi area of Kabul but later it was found out that it belonged to the Kochi tribe. He said that in 2005, 3000 Hindu and Sikh families lived in Kabul and other provinces but due to many problems, 1000 of them migrated to India. Uttar Singh, selected senator of Hindus and Sikhs in Lower House said that in 2005, they took two bodies from Kabul to Khost province, two other bodies to Jalalabad city in 2006 and another two bodies in 2007 to Ghazni province for cremation. According to him, a delegation met Hamid Karzai in 2003 and he ordered the Kabul Municipality to give a land to them for cremation but it is pending till today. He claimed that in 2003 they were promised 10 hectares of land from the Ministry of Hajj and Pilgrimage but they have not fulfilled their promise till now. Jugandir Singh of De Afghanan area of Kabul with a grocery shop said that his father-in-law died last year but the residents of Qalacha area didn’t allow his cremation. It was only after a demonstration and with police enforcement that they finally managed to do it there. He told PAN that he is an Afghan national and they have been living in Afghanistan for many centuries and their rights should be granted. Basan Singh, who belongs to Jalalabad city and owns a shop in Kabul, stated that his brother died two months back but due to lack of cremation area, they moved the body to Jalalabad city. He further added that many of the families are incapable of moving the body and are faced with serious concerns. Rol Singh, the spokesman of Jalalabad Inspector told PAN that they don’t face hurdles in cremation in Jalalabad. He said that they have a land of eight hectares in Behsud area of Jalalabad city and people do not get disturbed. Engineer Abdul Ahad Wahid, deputy of technical and constructional department of Kabul municipality told PAN that the Hindus and Sikhs are given the area in Pul-e-Charkhi and it is the government’s property and not of the Kochis and no one has the right to stop them from cremation in this area. He asked the Hindus and Sikhs to refer to technical and constructional department of Kabul Municipality so that the land can be officially given to them. But Abdul Wahid Qaney, in-charge of the media office of Hajj and Pilgrimage Ministry told PAN that they have no information regarding the 10 hectares of land promised to the Hindus. He added that if they have any documents, they should refer to the Ministry so that the land can be given to them. A number of residents of Qalacha area confirmed that there was a land for cremation but now due to the influx of population, people don’t want bodies to be burned near their homes. 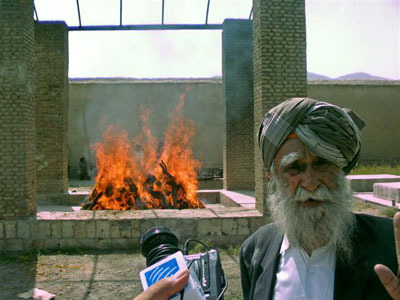 Asadullah, a resident of Qalacha area said that when Hindus perform cremation, a smell is produced that is suffocating. He elaborated that before there were few homes and the area was surrounded by agricultural land but now there are many homes built. Haji Muhammad Hassan, another resident of Qalacha area said that the smoke arising from cremation makes people ill and has a very bad smell. 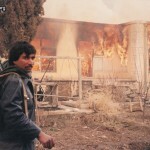 Zabiullah, the head of the Qalacha area said that four years back, the residents gave the Hindus one year to find another place for burning bodies. He said that people only remember Hindus and their cremation when a Hindu dies. Apart from that, they are not even concerned. According to the rituals of Hindus and Sikhs, they have to put all the ashes in a copper or mud pot and drop it in the Ganga River (situated in India) just the next day of cremation. After cremation, there are two to three days of funeral and prayers where the attendees are given cooked rice, pulses and beans. The survey (Save the Children's 12th annual Mothers Index) considers Afghanistan the worst place to be a mother, with women having a life expectancy of 45 years - the world's lowest - and one of every 11 women dying in childbirth. One of every five children in the country doesn't live to age 5.